Bydand B & B and Quad Tours: Bydand is situated on a working citrus farm in the heart of the Sundays River Valley close to the Addo Elephant National Park. Accomodation is in comfortable, tastefully furnished en-suite double or twin bedded rooms overlooking the orchards. All rooms have air-conditioning and ceiling fans. Guests are free to walk about as they wish, or to simply laze on a lounger next to the pool. 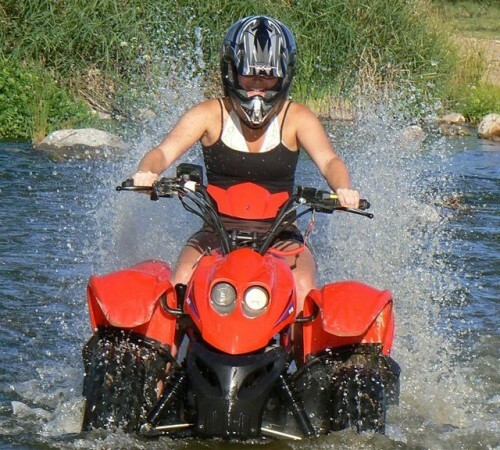 For the more adventurous there are quad-bike tours of the farm – including a river crossing! Quad-bike, or Landrover tours of a nearby private game farm can also be arranged. There are a number of game reserves close to Bydand including Schotia Safaris and Amakhala. Game drives to these and the Addo Park can be booked for you in advance. Don Lidgley, South Africa: Margaret has done a wonderful job at Bydands combining a very high standard of accommodation with a welcome to be treasured and all that breakfast could ever be wished for. Neville And Liz Louw, South Africa: We had a most pleasant over night stay at Bydand. The room was large, spacious, very clean, neat and tidy. The owners are friendly folk who were most welcoming. The pool looked most inviting. Sorry we had left our costumes at home. The wafting scent of orange blossom was the final finishing touch to a very good stay and the breakfast was delicious. Thank you all and we will be back. Mark Johnson-Ferguson, United Kingdom:Margaret and her team are friendly and helpful, from email advice before we travelled to bookign safari for us to a choice of rooms on arrival. Lovely tasty filling breakfasts. We all (parents + 3 girls 13 – 8) really enjoyed the qud bikes – excellent thrills. Comfortable beds, nice pool. Elizabeth Couvaras, South Africa: Excellent all round. Hospitality and service very good. Diane Zhang, New Zealand: Had a wonderful time at Bydand. Great breakfast, good room and facilities and convenient location to Addo Elephant park. The hosts were really friendly and helpful. Would recommend for others going to that area.